On April 23, after a two-and-a-half-day Jury trial in the King County Courthouse in Seattle, a personal injury verdict was delivered by the jury in favor of the plaintiff represented by the attorneys at Davis Law Group, P.S. The issue of liability in this case was never in question. In the end, the jury agreed that the defendant was responsible for our client's medical bills, in addition to other non-economic damages. The jury awarded just under $90,000 for personal injury to our client, a 91-year-old woman who was injured in a West Seattle car accident. The damages were hotly contested. 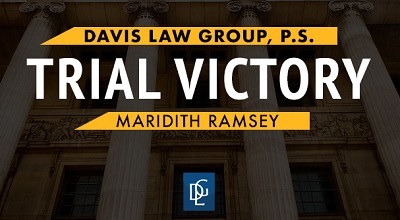 Davis Law Group associate attorney Maridith Ramsey diligently handled the trial with occasional assistance and encouragement from founding attorney Chris Davis. At the conclusion of the trial, Ms. Ramsey stated that: “We are so pleased to get a victory in this Jury trial for our client. At the end of a long process, it was a satisfying conclusion for our client and Davis Law Group." It was the first court case for Ms. Ramsey, a veteran of personal injury law who joined Davis Law Group in March 2017. Ms. Ramsey's skill, hard work and dedication to our client helped secure a terrific result. The case centered around a serious car accident which occurred in March 2015. Our client was returning home from having dinner with friends when she was involved in a T-bone wreck with a driver making an illegal left turn. The impact caused our client to crash into two other vehicles and sustain serious injuries. Our client had over $25,000 in medical bills as a result of the crash. Before hiring an attorney, the at-fault driver’s insurance company, Allstate, offered the victim less than $5,000 — far from a fair settlement. The lowball offer led her to hiring the experienced and knowledgeable team at Davis Law Group. Even after retaining an attorney, the insurance company continued to play hardball. Ms. Ramsey and Davis Law Group filed a lawsuit on our client's behalf. Allstate then offered $16,000 before trial. 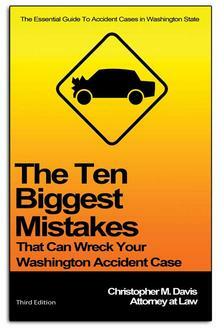 Ms. Ramsey repeatedly demanded Allstate’s policy limits of $50,000. After an unsuccessful round of mediation in which the defense would not budge, our client received an expedited trial date due to her age. As evidenced by the $90,000 Jury verdict for our client, Davis Law Group had every right to fight for appropriate compensation. The defendant fiercely contested our client's medical bills. The defense team brought in an out-of-state expert to testify that the medical bills were excessive. With help from Mr. Davis, Ms. Ramsey and the team at Davis Law Group got those medical bills — and more — taken care of for our client. "What kind of community do we want to live in?" Ms. Ramsey said after the verdict was reached. "Do we want to allow people who cause accidents to legitimately argue that the medical bills should not be taken care of? To nickel and dime the victim? Think about that. Should it be OK for the at-fault driver to say, 'I don’t want to pay,' and then hire attorneys and experts to fight it?" The victory is sure to be the first of many for Ms. Ramsey. "I consider this ruling a valuable step for Maridith, who is a rising star in the legal field," Mr. Davis said. "She has become a serious and important part of what we do at Davis Law Group." If you have been injured in a motor vehicle collision, contact Washington state personal injury law firm Davis Law Group. Call (206) 727-4000.